Now BBC's F1 commentator. Martin had a sports management company with Mark Blundell, 2MB wich he left in 2009 to concentrate on his own career and his son Alex who started in F2 2009. Wich includes Gary Paffett & David Coulthard among others. In 2008 he had a one off to race against his son in the Formula Palmer Audi series at Spa. 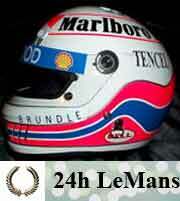 By 2008 Martin has won an unprecedented six Royal Television Society awards for his F1 commentating.